So you bought a puppy and he’s cute as can be. But…he’s eating your shoes. Or he’s chewing the furniture. Or he thinks the kitchen floor is his own personal bathroom. There’s a lot of ways to train your puppy to be well-behaved without sacrificing that fun-loving nature. The first step is to start early. 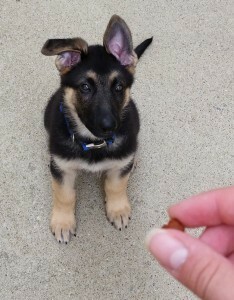 Training a puppy when he or she is young and his behavior moldable benefits you in the long run because you can stop bad habits before they ever start. Be patient. No puppy is perfect, the same way no child is perfect. There will be accidents, especially in the beginning, but patience is essential if you want to break bad behaviors without ruining your relationship with your pet. Use discipline not cruelty. Nothing your puppy does warrants cruelty. To make a point, always stop him in the middle of a wrong-doing and firmly say no. Or try ignoring him. Negative attention is still attention, so ignore him to show that bad behavior will not be rewarded with your attention. Be consistent. Training your puppy requires constant attention to detail. If you say one thing one day and something different the next, the lesson won’t stick and you’ll confuse him. Consistency is key. And be confident in yourself! You’re in charge. You know what’s best for your pet. Give commands firmly and confidently. Hold the leash confidently (tight enough that you won’t drop it, but with enough slack that your puppy does not feel any discomfort). Your puppy will recognize who’s really running the show! Use treats. Rewarding good behavior affirms to your pet that they’ve done something correct. Finding your pup’s favorite treat will help later on when training gets harder. Instead of chasing the family cat around the living room, you’ll want your puppy to sit or stay or come to you. Having the right treat makes it easier to convince him that good behavior is the best choice. Shoes are not chew toys. The couch is not a chew toy. Next time he goes for your favorite sneaker firmly say no, take it away, and replace it with something your puppy can chew. And remember to stop biting at the start. He might be cute and cuddly now, but when he gets bigger you won’t want those teeth nibbling your fingers. When in doubt, learn from others. Enrolling in puppy training classes can help even the most stubborn puppy learn right from wrong. Classes also teach your puppy how to interact around and socialize with other dogs! November 15, 2015 in Dog Care.